A plane has crashed on take-off close to the Imperial War Museum Duxford, near Cambridge. The privately-owned T-33 training jet went down on the Royston side of the airfield on Wednesday on its way to an international air display in Jersey. Two people escaped from the wreckage. A museum spokesman said both crew members were "fine". The cause is not known. The former RAF airfield at Duxford was bought by the Imperial War Museum in 1976 and hosts many air displays. East of England Ambulance's operations manager, Sue Pateman, said: "The plane came down approximately a mile to the west of the airfield. "Witnesses reported the two seat jet trainer clipping a tree before somersaulting into the ground and going on fire. 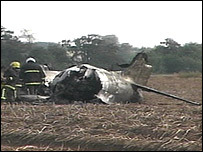 "Astonishingly, the two man crew escaped serious injury and managed to get out of the wreckage of the plane themselves. "The men, who are both middle-aged, were assessed by the doctor on the air ambulance but only one went to hospital. "The 59-year-old was taken to Addenbrooke's Hospital by land ambulance as a precaution. The other member of the crew was not injured. "Both men have clearly been extremely lucky to escape from an accident that could easily have had fatal consequences." 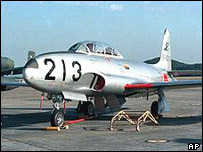 US-built T-33s first flew in March 1948 but continued to be used to train pilots into the 1980s. It is one of the best known military training aircrafts in the world - having been used by the air forces of 20 different countries for almost 40 years.